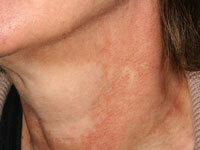 Poikiloderma of Civatte is a common, benign skin condition that mainly affects the skin on the sides of the neck. It mainly affects women. It characteristically spares the shaded area under the chin. The skin in the affected skin is red-brown with prominent hair follicles. 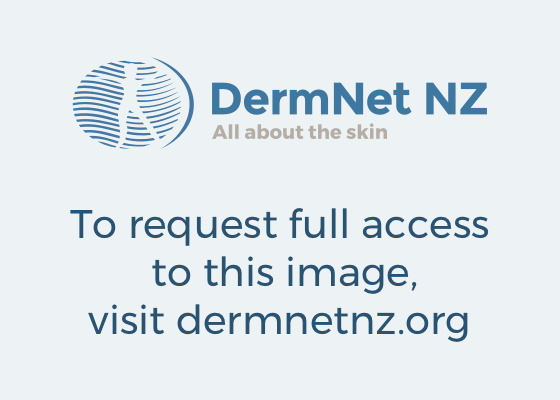 The term "poikiloderma" refers to a change in the skin where there is thinning, increased pigmentation and dilation of the fine blood vessels (telangiectasia). Civatte was a French dermatologist who first described a common weathering change that affects the skin of the sides and front of the neck. What is the cause of poikiloderma of Civatte? What is the treatment of poikiloderma of Civatte? There is no specific medical treatment for this condition. The patient should be educated about avoiding sun exposure and the correct use of sunscreens. The results of treatment may be disappointing in many cases.